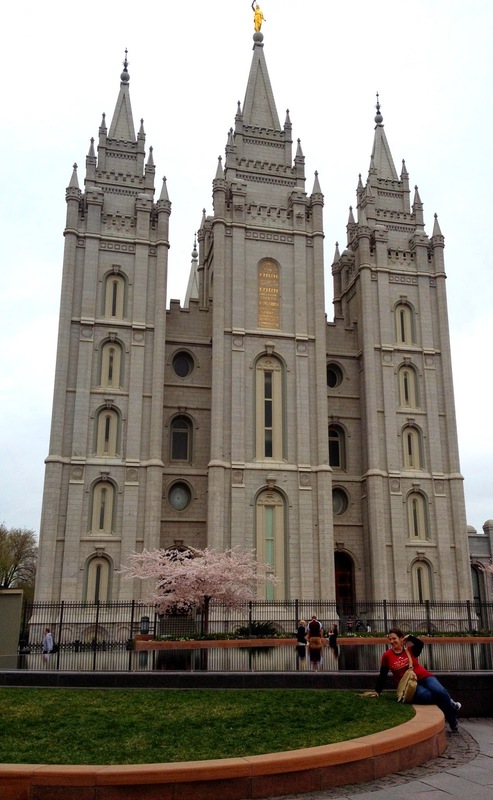 My Journey to Fit: SLC Recap Part 2, Complete With Amazing Race-Style Ending! SLC Recap Part 2, Complete With Amazing Race-Style Ending! Backtracking a bit from my yarn store escapade and the conference recap, here's some more of what we did on our trip to Salt Lake City. So much entertainment for two suburban girls! Amy snuck a picture of the RULEBREAKER with her feet on the seat right next to the sign that says "No Feet on Seats" - people also brought service dogs and bicycles on board (which were allowed). It was a fun way to get around the city, provided it actually went where we thought it was going! We laughed because we went there thinking we'd get the highly-recommended burgers, but both of us ended up going vegetarian. Our meals were really good. 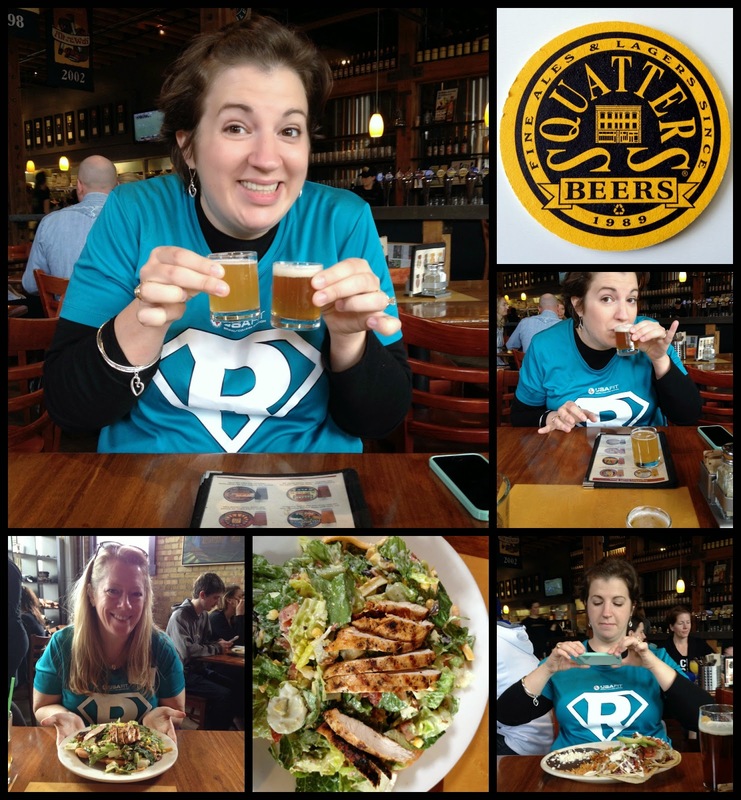 On Saturday, we decided to try another brewery for lunch. Amy picked one and mapped it out; once we broke from the morning sessions, we hightailed it to Bayou. Wouldn't you know it, after walking nearly a mile, we got there only to find it closed for lunch on the weekends. Gah! So we turned around and zipped over to Squatters - nothing like burning some extra calories before you eat, right? Squatters was great! We learned the previous day that you can't order a flight of beer to sample in Utah - the most you can get is two at a time. Our waitress was pretty cool and brought the three samples that Amy wanted to try all at once - she just put the extra one in front of me to comply with the rules. The close up on the bottom left is actually tiny-sized daffodils. 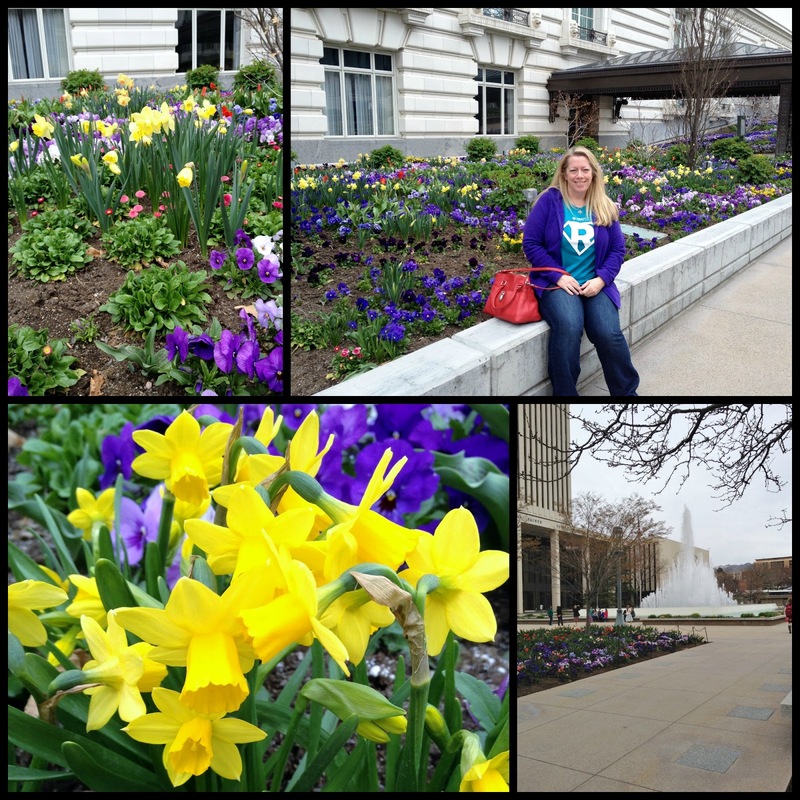 This area had tons of flowers, a huge water feature, cherry trees in full blossom and a large reflecting pool. Really, really pretty. Amy at the LDS Temple. We went to the mall afterward - it was right across the street. Amy was looking for something to wear to dinner that night, so we tried on some clothes at H&M - first time for both of us to shop there. She ended up finding a cute top at Loft, and I'm reminded of how much I wish there was one in our town - such cute clothes, such great sales! 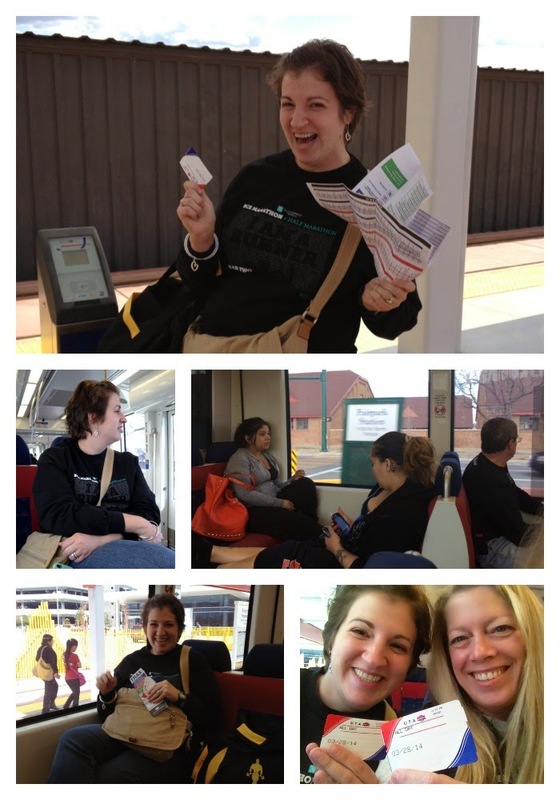 The next morning, we took the Trax back to the airport - this time, helping three other USAFit ladies who'd taken the more expensive shuttle when they arrived. At that point, we were old pros at it, showing them how to buy their tickets, etc. Shortly after we got there, we saw that our flight was delayed by nearly an hour. No worries - we had a huge layover at D/FW. We had lunch and waited. Then we decided that Starbucks sounded good, so I left Amy with our carry-on luggage and made the trek four terminals over to get our drinks. As I was walking there, I heard some high school girls exclaim "look, SNOW!" - and yes, it was snowing, if you tried to see it hard enough. Mostly just light rain. By the time I got back to Amy, who was sitting with her back to the window and hadn't noticed the weather, it was definitely snowing. Which was NOT in the weather forecast that morning - I'd checked! Iced venti nonfat latte in hand, snow in background. Amy's bag is the black and yellow one going up first; mine is the red one near the end (just in case you needed to know that pertinent information, haha). 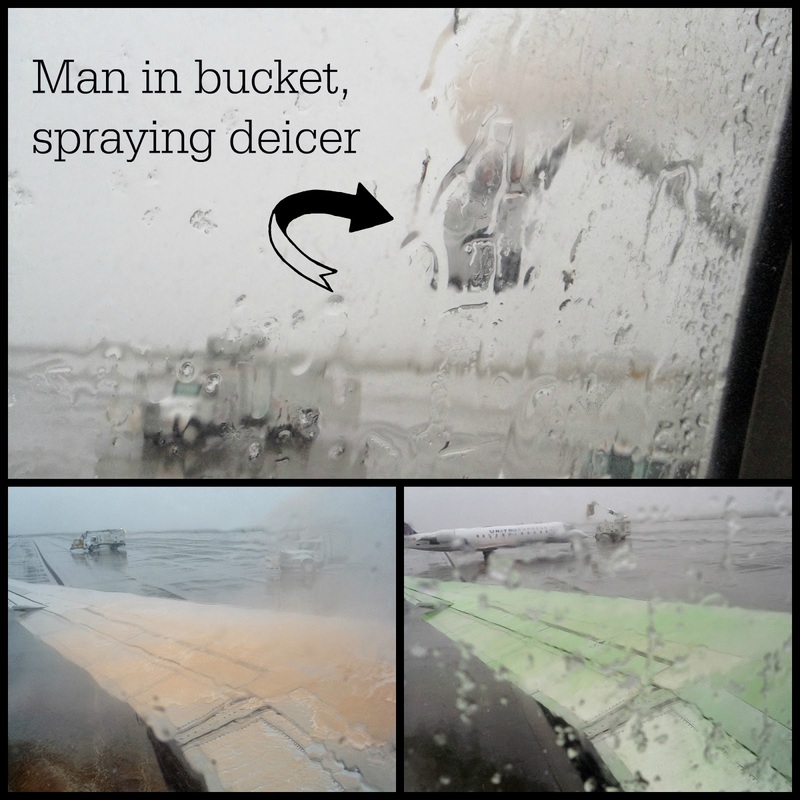 ...and now I know what it takes to deice an airplane. Great. We're going to miss our flight and end up spending the night in the airport. The flight was pretty uneventful, although I did get to hold a baby(!!!) for a while. At one point, I remarked to Amy that it felt like we were speeding - I don't know why I thought that, except for the engine noise, maybe? It made sense, though, if the pilot could get us there quickly, as most of the passengers had connections that they were going to miss. And sooner than I expected, they announced we'd be landing, and gave out the gate connections - we were going to taxi to a gate in the C terminal and had to get to the B terminal via Skylink (their monorail). We had hope! We might actually make our flight! It was then that we realized we'd checked our running shoes when we let go of our carry-on bags, and we'd have to run in our Danskos, oof. At least we only had to deal with our USAFit backpacks, instead of dragging our bags. Now this is the look of relief. Two thumbs up for making our connecting flight home! Two-inch platforms, rigid soles...pretty to look at, but I never want to run in mine again! I love love love this recap. So many adventures and so nicely written by you. I loved every bit of it. Thanks for sharing Shelley. I've done many a sprint like that through an airport... did your luggage make the second flight? I'm so glad you guys used your time there as an opportunity to visit and see something of SLC other than the inside of the conference rooms. So fun! The luggage made it! Although at that point I really didn't care since we were going home - I knew I'd eventually get it, and I had everything I needed at home. So now this begs the question, if the airline can get your luggage transferred when you are sprinting for the connection, how come they seem to so easily lose luggage at other times? Seriously! Oh my goodness, you guys did have your own Amazing Race adventure! What a lot of fun you had. Just the right amount of time to visit a new city. Especially since you were adventurous enough to get out there and explore. And oh, yes, the sprinting through the airport in clogs. They hurt me to walk on long-term, but I like to wear them to travel--slip on and off so easily. I'm so glad you made your flight!! And your Dansko's with knitting on them?? Your whole knitting club must be jealous! I love your recap! It almost makes me want to do it again. LOL! I absolutely loved this recap!! Glad you made your flight. I hate flying actually - all the sounds, the bumpiness - and the last few times I've flown by myself so there is no one to comfort me! What an adventure you had!! Glad you made it to her connecting flight...I have spent the night in the D/FW airport because of flight issues (come to think of it I flew out of SLC after a week visit prior to moving to UT) and it was horrible. Your yarn shoes are so fun! And woo hoo for making the flight! I love reading this, since it gives me good memories of my trip to SLC last year! I thought the flags were a gas! And loved the Temple campus. Did you notice how nice the Mormons are? Everyone was so nice to me and my mom when we were there! 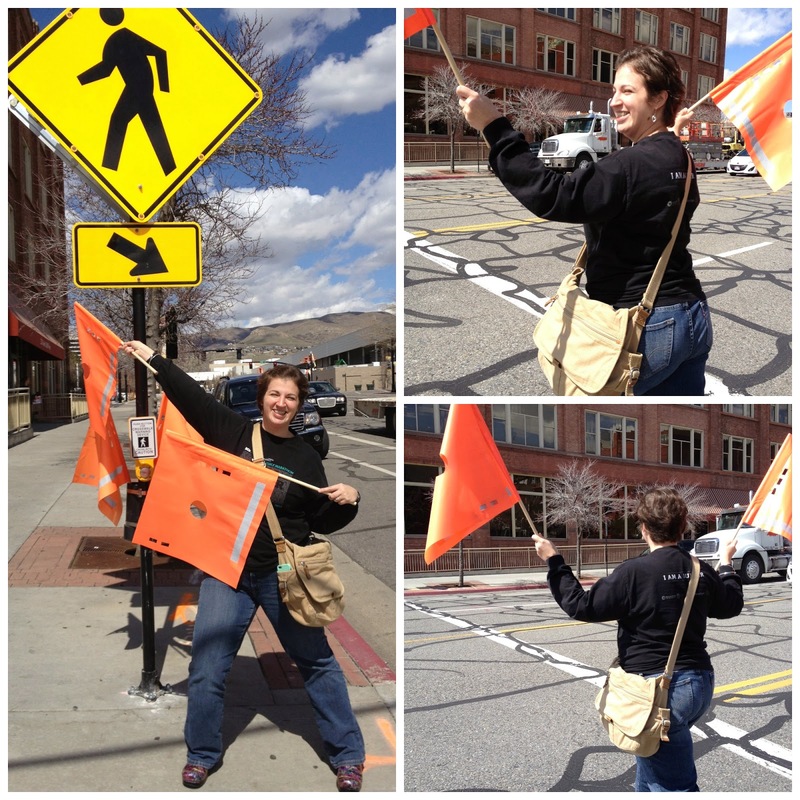 We thought the orange flag idea was genius. Definitely could use them here, although I wonder how many flags would end up in college student's apartments/dorm rooms, lol. I stared at the caption LDS temple for a while trying to figure out what it meant LOL. Then I got it.